Okay, so it’s a buzzword. One of the most popular right now, right behind “chatbot” and “AI”. But marketing automation is also one of the hottest marketing trends of the last few years. The market was worth 100 million USD in 2009, but analysts predict it will be worth 5.5 billion USD by 2019. No other digital marketing segment has seen that kind of growth recently, and soon enough marketing automation will be a staple for most companies (it already is for one in two companies in the US). Let’s start with a definition to give some context to the rest of this article. Marketing automation is a technology. It’s not a strategy, and that’s where it differs from inbound marketing, lead/customer nurturing, account-based marketing and other marketing strategies. Marketing automation is a technology that aims to facilitate the implementation of strategies, by collecting and organizing data to automate certain repetitive tasks. Sending emails, for example, or posting to social media, or even personalizing communications. To truly understand what marketing automation is all about, we have to take a step back and explore these three pillars. The heavy hitters in the industry (Marketo, Eloqua, Hubspot…) tend to bring all these functionalities together within a single tool. An alternative would be a marketing stack made up of tools that each fill a specific purpose (thus providing greater flexibility and the opportunity to test new tools, better adapted to particular situations). The database clearly plays a central role in marketing automation, as do all the mechanisms that allow us to enrich, process and segment our data. The automation engine relies directly on the data you have available, which in turn is used to set up automated marketing actions. As you can imagine, there are certain prerequisites you should have in hand before launching a marketing automation program, or you risk setting back your implementation by months or even a year or more. So… how should you prepare? Marketing automation exists to support the marketing strategies a company wants to implement. And a marketing strategy can only succeed if it’s based on clear, measurable business objectives. Is your focus acquisition, or retention? In the context of acquisition, one of your marketing automation KPIs might, for example, be the amount of time it takes to convert a lead into a client. For retention, a customer’s purchase frequency might be more important. In either case, base your strategy on solid objectives and make sure you have clear KPIs that you can use to evaluate how effective your marketing automation has been, and adjust your actions accordingly. 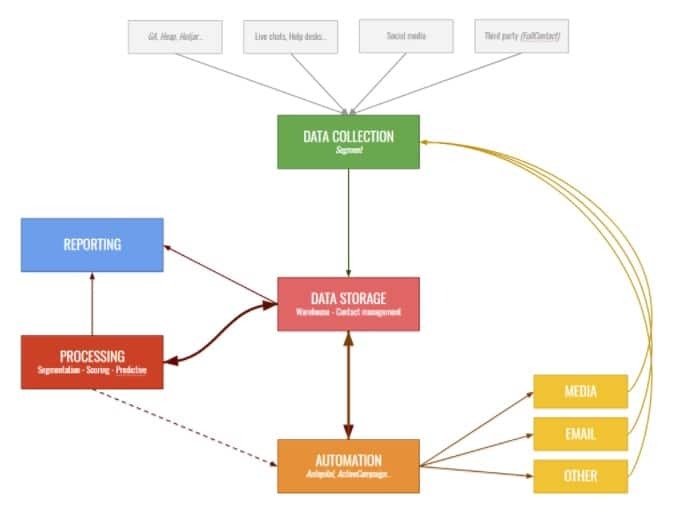 Data is at the heart of marketing automation. It’s the gas that powers the automation engine we talked about earlier. If your data is bad, the engine will sputter out and you won’t get very far. Clean data, therefore, is an essential prerequisite, even if it’s not the most glamourous. Let’s look at an example. You are a company setting up a marketing automation platform. The data you have on your prospects looks like this: email, last name, first name, organization, organization details, phone number, address, etc. You’ve also got your behavioural data: pages visited, ads seen/clicked, emails opened/clicked, etc. For customers, this data is obviously even more robust, plus you have access to their monthly value, lifetime value, the number of times they’ve contacted your support, etc. Start by taking an inventory of all the available data. Then check to see if it’s usable: for example, is the province always written out properly and in the same way (Québec, Quebec, QC, Qc)? When you hit a snag, you’ll need to do some standardization work. Thankfully, technology exists to do just that, so you shouldn’t have to do it all manually (for example, using dropdowns instead of open text fields is a way of automatically standardizing the way your data comes in). Finally, try to predict what will happen to this data once it’s in use, so you can prevent it from dropping in quality once people are manipulating it. Set up different levels of permissions, as well as governance processes to ensure that none of the stakeholders with access to your data can damage it. If it seems like I’m being a stickler about data, it’s because good data is what allows you to segment your communications. The better the quality of your data, the more accurate your segmentation will be, and the more opportunity you’ll have to personalize your communications, making your audience feel like they are engaged in a one to one conversation with your company. You now have clean, usable data. But you can still enrich it. Firstly, there are third-party services that, using nothing more than an email address, can track down all kinds of data on your contacts from social media and other online profiles they’ve created. You can also put tracking mechanisms on your different properties to capture all the behavioural data generated by a contact’s visit. Finally, you can tie your database into the platforms you’re already using, from social media, to management tools, to customer support. By the time you’re done with this step, every contact in your database should have a huge amount of associated data. This is the bread and butter of marketing automation: automating your repetitive tasks. Start by listing these tasks, processes and workflows. Be exhaustive and don’t forget about internal processes, like sending an alert to a rep when a prospect gets hot, or updating their information after they’ve taken a particular action. Then, map out these tasks and processes, including their triggers (e.g., a prospect subscribes to your newsletter) and the actions that follow (e.g., the prospect is added to a list and a double opt-in email is sent). Don’t forget the conditional actions throughout the sequence (e.g., what happens if the prospect doesn’t validate their email through the double opt-in process?). Lastly, prioritize this list of repetitive tasks based on their importance to your customer journey, and start by putting in place the key tasks that will allow you to advance your contact towards conversion. Your choice of marketing automation platform should rest on two main factors: your business objectives and the strategies you’ve chosen to reach them, and the other technologies you use. That’s because your marketing automation technology needs to be able to integrate perfectly with your other tools so that your data can be perfectly matched between them. And don’t just look at what you’re using now, but also the technology you’re planning to use in the medium term. This prerequisite concerns your marketing strategies (inbound marketing or lead nurturing, for example) more than marketing automation. To communicate in a relevant way with your target audience, you need to know exactly who they are. You need details about their motivations and needs (persona), but above all you need to know their buyer’s journey. That’s what will allow you to create automations that will help turn leads into customers, and purchases into repeat purchases. Marketing automation works in tandem with your CRM, and these two tools need to work in concert rather than in silos. The same thing goes for your sales and marketing teams; they need to be perfectly aligned. For example, these two teams will have to collaborate to define a common lexicon of terms: what is a prospect, a lead, a MQL (Marketing Qualified Lead), an SQL (Sales Qualified Lead), etc. You can then use these shared definitions to outline a lead scoring strategy, to ensure that a marketing lead is only handed over to sales once certain pre-defined and agreed-upon criteria are met (the main critique of lead scoring is that sales leads are of poor quality). To cement this alignment, draw up an SLA between your teams, defining your common lexicon as well as the targets each team commits to achieving to support the other in their work: for example, marketing commits to generating 20 MQLs per week, and sales commits to following up with each lead within 48 hours. The number one factor in automation success is preparation. When it comes down to it, the importance of having high-quality data cannot be overstated, and you likely won’t be happy until you have a large amount of it. With this list of prerequisites, you should be able to approach your marketing automation needs in a more structured way, and increase your chances of success. The biggest players in marketing automation are currently (in alphabetical order): Act-On, ActiveCampaign, Adobe Campaign, Oracle Eloqua, Hubspot, IBM Silverpop, Infusionsoft, Marketo and Salesforce Pardot. Oh and by the way, shout out at Drip for putting together a free school for marketing automation knowledge, with over 20,000 words spread across 5 chapters featuring infographics, podcasts and more. Want to discuss about marketing automation with our team? Let us know!